Errol: Starting is still doable! 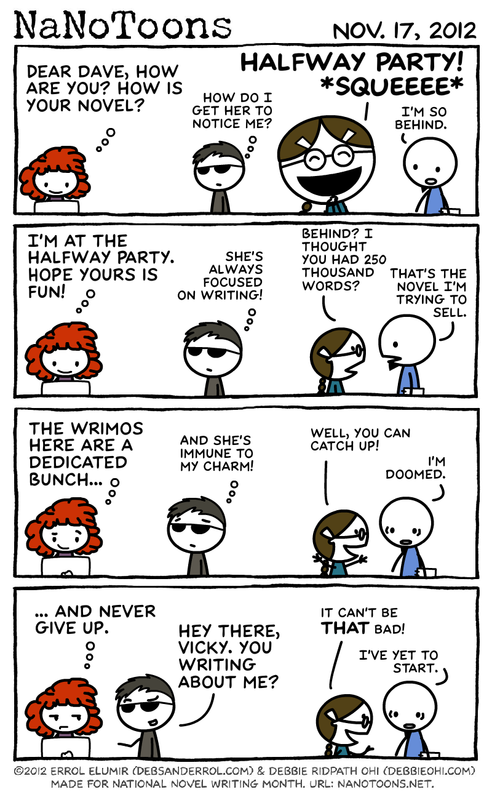 When I first heard about Nanowrimo, I was so pumped I didn’t care how late it was. It’s awesome! If you are hearing about it just now, do it! This entry was posted in 2012 and tagged 2012, ed, fran, tim, victoria. Bookmark the permalink. Oh YES. Definitely plenty of time to write and catch up and everything. 🙂 I hit my 50k in the first week and now I”m just writing along with the story as I go. I’m encouraging my wrimos to keep at it—because NaNo is all about the fun. As long as you remember to have fun, it’ll be good. yep that’s me, I’ll not hit 50k this month, I believe. I stopped at 35k a few days ago. You know… I kinda miss Dave. Me too! 😀 He’s not gone! Poor Tim. He’d better get started on his novel soon! I’m spot on then, great minds think alike! aha! I’m a little behind, but I’m hoping to use the holidays to catch up a bit! Yay holidays! 😀 You can do it!